Tastes like a Cherry Cordial Without The Mess! These amazingly rich Milk Chocolate and Cherry flavored bars are proud to be a part of the Barkeater family of artisan chocolate bars. 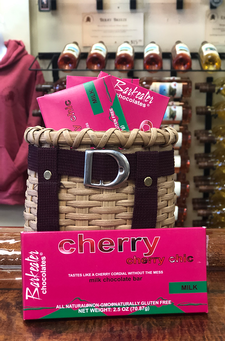 Cherry Chic is creamy milk chocolate that melts in your mouth from your first decadent bite. You will be instantly addicted to the amazing cherry flavor and gourmet chocolate combination. If you are buying 1 to share...trust us, you will want to have your own!